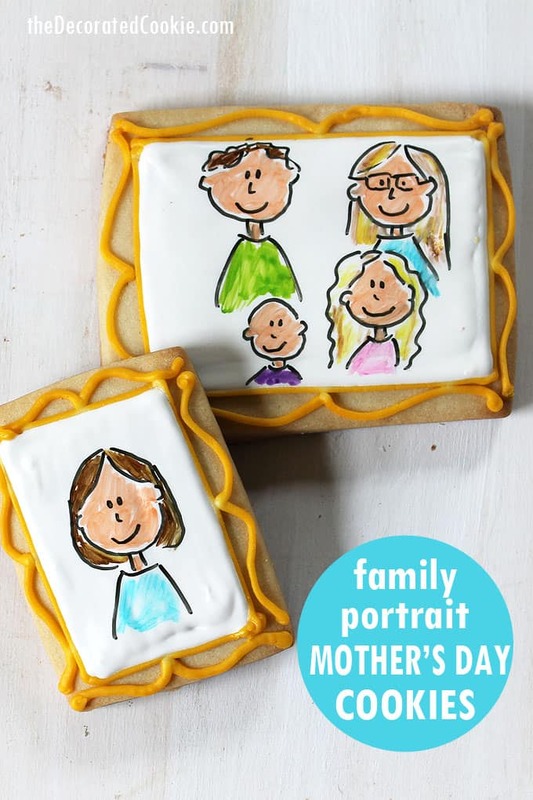 How to make family portrait cookies for a Mother's Day gift idea. 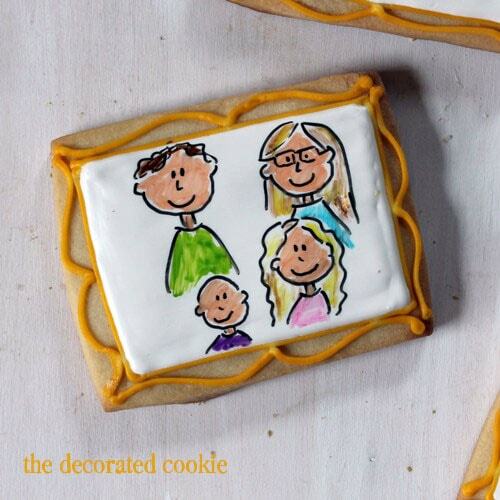 How to make family portrait cookies for a Mother’s Day gift idea. 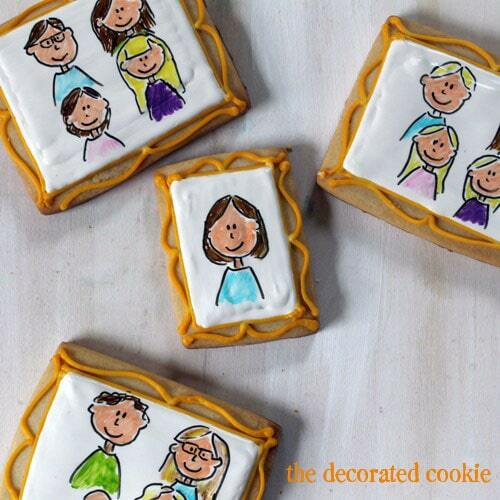 Followers may notice my recent obsession with these portrait cookies. I started with this gift for my niece. 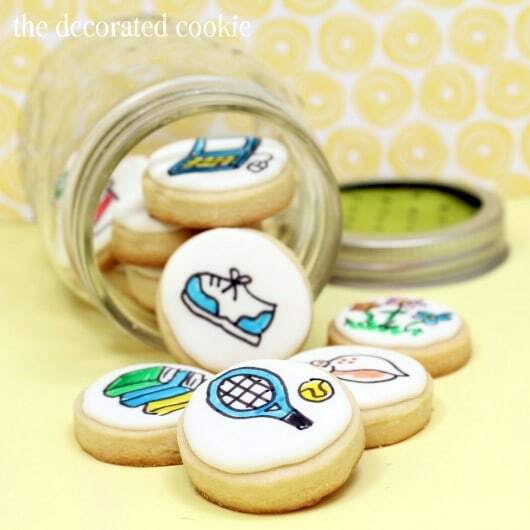 The next year I made these favors for her art-themed birthday party. 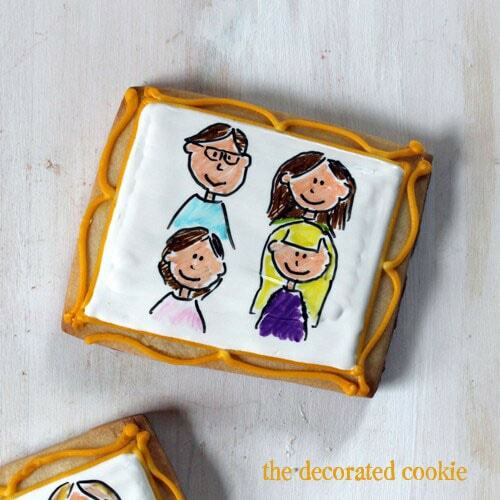 And now, family portrait cookies for my mom for Mother’s Day. This is my sister and her family. And this is me and my family. Seriously, the likenesses are, ahem, uncanny. No really. It’s as if I studied the fine art of portraiture. Gift-buying in my family is never easy. We all have way too much clutter and need very few things. That’s why I always turn to cookies. They can be personalized and they never leave clutter. Only crumbs (hahahaha…. groan). 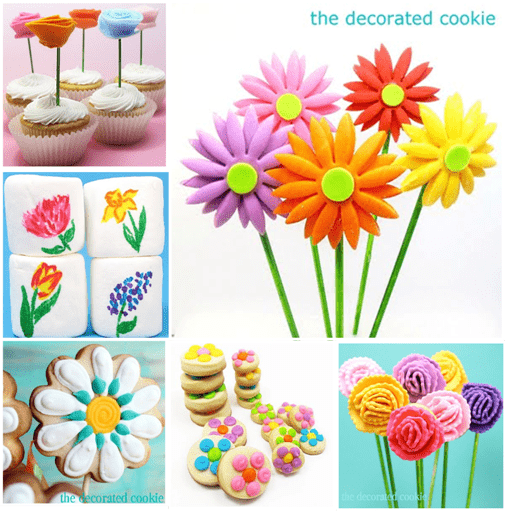 And of course, there are plenty of flower-themed ideas. 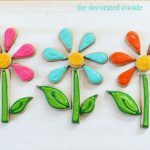 Felt flower cupcake toppers, gerbera daisy cookie pops, carnation cookie pops, bite-size daisy cookies, how to make a flower cookie arrangement, springtime marshmallows. Cut out rectangle cookies with my cookie dough. Bake and let cool completely. Then I prepared my royal icing and tinted it white and gold with Americolor Soft Gel Pastes (Bright White and Egg Yellow). I prepared a disposable decorating bag with coupler and tip, size “4″. I filled the bag with the gold icing and closed with a rubber band. 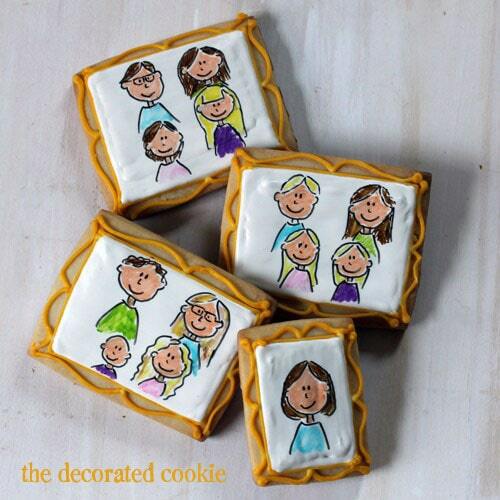 I piped rectangles on the cookies, leaving a border. Then, I switched the tip to size “3″ and piped the frame part. After the gold set a bit, I thinned the white icing to flooding consistency, filled an empty decorating bag, snipped the tip and piped to fill the frames. Let the cookies dry super duper well, overnight. 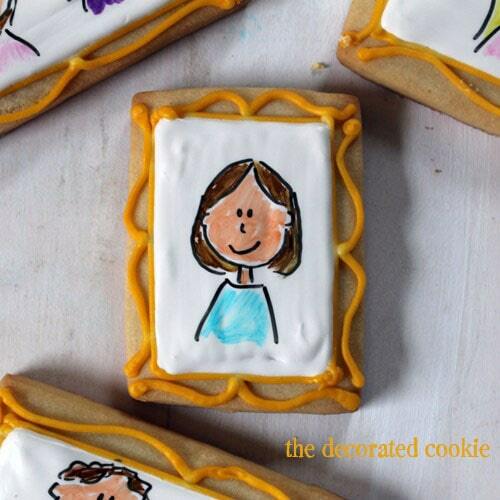 And then I drew with the portraits with edible writers. 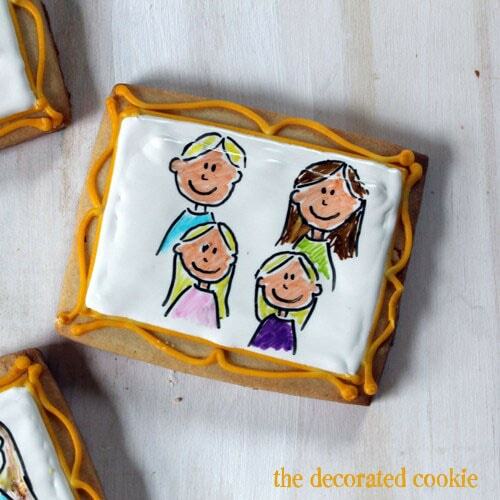 For basic cookie decorating how-tos click HERE. For tips on buying and using edible writers, click HERE. 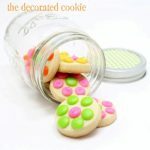 Ahhh I want my family COOKIE-D!! So cute!! This is a MUST-DO! Darling! Oh, I just LOVE these so much!!! Thank you for sharing and would love to try them! Have a wonderful week! What a fun idea! Look at all those girls – they run in my family too. I love your illustrations. And – Happy Mother’s Day to YOU! Yep, ALL girls! We each have two, so my mom has 6 grandkids, all girls. And if you time it right in the year, their ages go 4, 5, 6, 7 and 8. Except for Violet, who is 0.
they are adorbs!! 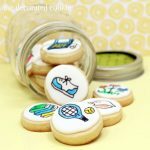 Love the little edible pictures!! 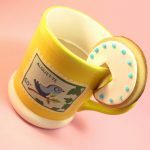 I just love this idea as a gift for a family member! Fantastic! Just wanted to ask which brand and colour marker/s did you use for the skin? Hi Laura! The Americolor Gourmet Writers have a “peach” color (the marker itself looks pink). Not sure if other brands, too. Kopykake dual end may also have the peach.